UPDATE: We tested Dance Dance Revolution (DDR) in our classroom. Read our review on using DDR in the Classroom. I’ve decided that I’d like to experiment with Dance Dance Revolution in my classroom. Dance Dance Revolution (DDR) is a video game by Konami that was released in the arcades of Japan in 1998 and is now available across several home entertainment systems, including Playstation, Wii, and Xbox. Players stand on a dance platform with arrows pointing up, down, left, and right. By listening to the music and watching a computer screen, players need to tap the corresponding arrows on the beat. There are different levels of difficulty, so game play can range from simple to challenging. On the Nintendo Wii, Dance Dance Revolution Hottest Party includes the use of the wii remote. Up to 4 players have to move both their hands and feet to the beat. Overall, DDR is a high-interest, low-skill activity that appeals to the video-game generation, and as a teacher who continually looks for innovative ways to achieve curriculum expectations through technology, DDR is in my sights. 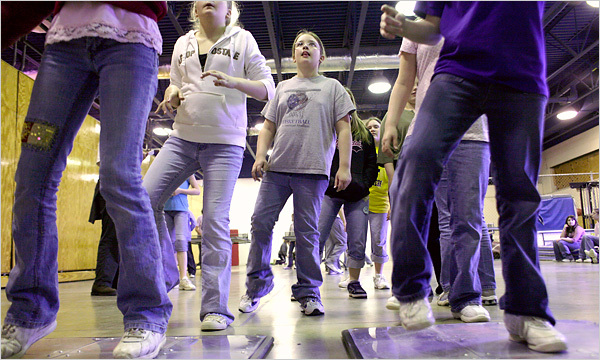 In April 2007, the NY Times reported on how some Physical Education classes are using Dance Dance Revolution to get Grade 7 students moving. A projected 1,500 schools in West Virgina are expected to be using the game by the end of the decade. “At least 10 states” in the US are using DDR as a “regular part of their physical education curriculum” to fight obesity. You could use DDR as an extra-curriculuar club, to meet daily physical activity (DPA) requirements, or as part of a phys-ed program. Most students will be watching the screen and practicing moving to the beat while they wait for their turn on the mats. Depending on how much you’re willing to spend, you could have up to 4 people actually playing on the videogame system. You can set the difficulty level for each player independently, which means that an expert and a beginner could be playing at the same time. Fun, high interest game that can appeal to some of your weaker athletes. Appeals to multiple intelligences: visual, auditory, musical, kinesthetic, and interpersonal intelligences. DDR is not a replacement for quality physical educaton instruction. Nor is it a magic solution to fighting obesity. However, it can be part of a healthy-living program moved towards getting students to live healthier lives. DDR does not appeal to everyone. Strong athletes and competitive students will still look forward to sports and skill-based programming. Some students feel self-concious playing DDR. Because you have to physically move, it’s a litle more “dorky” than playing Guitar Hero or Rock Band which operates on a similar concept of tapping the right button on the beat. However, if you have the entire class “playing the game”, even though only 2 or 4 students are actually using the controllers, they might feel less self-concious. Cost. Many schools have a data projector (or at the very least, televisions), so adding a basic Nintendo Wii ($270, comes with 1 remote controller) and DDR game / mat package ($80) would cost an additional $350 (plus tax). Our current goal is to buy a Nintendo Wii for the classroom. Having worked with high school students on cruise ships, there are several things about the wii platform that appeals to us as educators and technology-enthusiasts. Nintendo wii uses a motion-sensing remote, so depending on the game, you’re moving your body to swing the tennis racket, roll the bowling ball, or drive the steering wheel. Wii Fit uses a balance board that you stand on to do a number of strength and balance activities, including yoga, running, and muscle toning exercises. Generating money online typically requires you to be over the age of 18 to sign up for various advertising networks, affiliate programs, or even to get a paypal account. So, in the meantime, we’re going to use our Shoppers Drugmart Optimum Reward points to buy our Wii. (We already spend too much of our money on technology projects in our classrooms: LCD (data) projector, wireless keyboard). This way, we buy the things we regularly buy at Shoppers, and when we’ve saved up enough rewards points, we buy our Wii. Shoppers Drugmart currently offers 10 Optimum points when you spend $1. They offer a sliding scale reward system, where 3,500 points is worth $5 of merchandise, however, 75,000 points is worth $150 of products. From the table, we see that to earn $150 of rewards, if we wait until we get 75,000 points before we cash out, we have to spend $7,500 in the store. However, if you keep on cashing out yur Shoppers Optimum Rewards points when you get $5 or $10 of rewards, then you would have to spend $10,500 of your own money before you had made $150 in rewards. Bottom line is that you get the best return if you wait until you collect 75,000 points before you cash in your rewards. But spending $7,500 at Shoppers Drugmart sounds a little ridiculous. We’ll never get our Wii at this rate. So, that’s why we wait until Shoppers Drugmart runs their special 20x the points sales, where most items are eligilbe for 20x the points. In this case, if we spend $375 of our own money during the 20x the point sale, we can earn $150 of rewards merchandise. So. Let’s see how long it takes us to get a wii in the classroom. We’ll keep you posted. I absolutely love using the Wii for this kind of combined exercise / fitness / dance purpose. Anything that gets people up onto their feet and moving has to be a good thing.